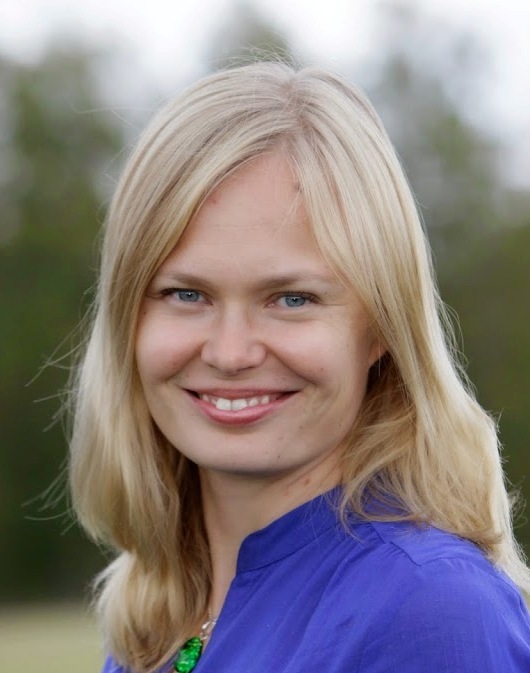 Hanna Kosonen is a new member of Finland’s Parliament for the Centre Party (Electoral District of Southeast Finland). Before that, she won a bronze medal in the long distance at the 2000 World Ski Orienteering Championships in Krasnoyarsk, and a gold medal in the relay. She has been Executive director of Wood in Culture Association, a cultural producer and expert for Maahenki, a publishing house specialised in particular in nature, countryside and art, and for Diges Ry, the Business Creative Industries Development Association. In the last 2 years, she has been an entrepreneur, and she is also a forest owner. In the Parliament, she is a member of the Environment Committee, of the Education and Culture Committee, of the Finnish Delegation to the Nordic Council and of the Baltic Sea Parliamentary Conference . How did you come into politics? I was asked to be a candidate many times in 20 years since I was relatively well-known, at least in my region or in the ski orienteering world. I thought that I was not ready, and definitely not political enough for this job. But I have been really interested in politics for many, many years, so recently I thought that maybe I could try it. Already when I was on mother’s leave, I could spend hours just listening to radio programmes about politics! Then I decided that when I would be near 40, I would be ready for this kind of thing. And also now I have done a number of things in my life, I have more experience and I have something to bring into politics. First, I was a candidate for the European Parliament’s over a year ago; it went quite well for a newcomer, so the party wanted me to represent my area in this Parliament election. And I made it! How is it to be in the Parliament? Of course it’s a huge change in my life from normal life to Member of Parliament and so quickly. I have only been one and a half years in politics and the first thing that I do as a politician is to decide about an important government programme, I am part of that! It is certainly a huge change, but I am really interested in this work. I really wanted to become a Member of Parliament, and it is an honour, I am really grateful for my voters that they wanted me to come here. I will do as much as I can for them. You have two young girls, is it easy to manage your family and Parliamentary life? You have to organise your life really good and of course all my free time I would spend with my girls. But I think I’m a better mother because I have a really interesting job, so it’s really a good combination. What is the most interesting in the work in the Parliament from what you know already? Actually I just had a meeting with people who are working on the simplification of the legislation and rules for making life easier in Finland. So now I am just about to go and email to the Minister in charge of employment to ask that he would give instructions to employment offices in Finland in order to allow unemployed people to do voluntary work. It’s not written in any law that you can’t do that, it’s only the way that the official interpret it. And what is boring in your new work? As you can guess, I am very active, and I find it hard that we have a lot of meetings and we have to sit for hours and hours! Generally, it is interesting, and you can contribute. But sometimes meetings are really boring, in particular when you know that the topic has been discussed already for years and years, and all the angles considered. VR, the Finnish railways company, has announced that several rail routes would see reductions or be cut outright, and that 28 train stations across the country would be shut down. I understand that you town, Savonlinna, is involved in these cuts. Are you participating in the discussions? Yes, of course, because in my area there is a train line between Savonlinna and Parikkala which is really important if for example we want to get from Savonlinna to Helsinki. VR plans to cut the morning and evening trains, which will be a serious problem. We are negotiating to get at least a replacement by busses. It is a minimum for those who want to participate in some meetings in Helsinki and come back home in the evening, without spending a night. But when we look into how our train company has managed its huge train monopoly situation, it is clear that there are a lot of things that they could have managed better. In addition, there is a contract between the state and VR, but I am really concerned because I feel that they have not respected it. It is a serious matter. More generally, what do you think could be done in order to develop this region of Eastern Finland which is losing its population? Actually, our government has proposed in its programme measures which should benefit Eastern Finland, such as for example the measures in favour of the bio economy. When you examine it, the bio sector consists in the valorisation of the forest and the food, and we have a lot of them in Eastern Finland. It is clearly our future! I think also that tourism is really important for us today, and I think it could be still more important in future. I live in the middle of Lakeland district, and I think it’s one of the world’s best hidden secret, when you consider how beautiful and peaceful and pure it is. Is there some plans to reopen the Retretti [a major art museum in Punkaharju, near Savonlinna, which is unique in that most of its exhibition space is undergroundin large and deep man-made and was closed in 2012 due to a bankrupt]? I hope so because this cave exhibition venue is really unique but I’m not so hopeful that the state would do something about that, but I think if some private owner would be interested in that then we could open it again. You have been an entrepreneur. From your experience, what would make life simpler for small companies? The simplification of the regulations is I think the most important thing. In Finland, today, a very small company must respect the same regulation hits as the big companies, and you are not able as a small entrepreneur, with one or two persons, to deal with the same level of bureaucracy as Neste Oil or Nokia! It is a huge thing for small companies, and this reform is the most important thing to allow small and medium companies to be able to focus on their activities instead of working to satisfy the state’s bureaucratic requirements. Also, predictability – that the state doesn’t change the legislation in every four years – is important for companies of any size. I’ve seen also that you are active in the Nordic Council. Are you very involved in the environment matters? I am the Environment and Natural Resources Committee’s chairman of the Nordic Council, so I am certainly very active in this domain. It is very clear for us, in the Nordic countries, that a strong cooperation is necessary in environmental matters: the air, the water move, they do not stop at the border and ask for permission to cross it! So we need to cooperate with our neighbours, but in addition, we share the same interest and the same culture concerning the global environmental challenges such as climate change. In the Nordic countries, we are quite active, we could forget about the global problems, but in fact we need to consider the whole world and its future. We should be really worried about climate change. Are you dealing with other topics than the climate change? We certainly, we have a large number of topics to address. To name one of the important ones, we have to deal with the serious problem of the situation of the Baltic Sea. And we have some aspects of the biodiversity, such as management of the raccoon dog (supikoira in Finnish) in the Nordic countries. As a sports’ champion, do you think that young Finnish people are practicing sufficiently sports today? Some does a lot and some doesn’t at all, that’s the problem. There is a huge difference between different sorts of young people. As proven by research, practicing sports is really the answer to many of the present problems for young people, to improve their physical and mental health. It has also been shown that when you are active in your life, you treat others better. In our programme “Finnish Schools on the Move” (http://www.liikkuvakoulu.fi/in-english), it has been proven that there is less bullying between the children when the children are active. Bullies have a tendency to calm down after running one kilometre! So I think it’s really important to develop sports for children. More attentive atmosphere in the classroom tends also to affect positively the learning results. My last question: let’s suppose that Juha Sipilä invites you in his office, and asks you what would be the most important thing that the government should do now? Prevention, I have already talked a lot about this! We need to develop a policy of early prevention of health problems. Physical activity and nutrition are really effective and they are key for the health of Finnish people and for our finances. We need also to improve our knowledge about health promotion, by developing the research on these matters.